The truce with the Erasi allows the Empire and the Shara Daim to grow, expand, and develop new technologies. But the Erasi have a long memory, and the Weaver of the Erasi will not allow the alliance more time to become a greater threat than it already is. Lord Sentinel Adrian Farkas-Reiss and Kar Daim Anessa plan for the inevitable Erasi attack. Their only chance is to strike first, and Adrian reaches out to an enigmatic alien race that could be the key to ending the Erasi threat. Massive fleets are preparing for the end of the truce and an all out war. Two Inquisitors of the Hand of the Empire travel aboard an experimental ship, on their way to investigate the reports of pirate sightings, hoping to find the proof of Erasi involvement. All the while an ancient power walks among the people of the Empire, watching and learning. Plotting the downfall of all life in the galaxy. 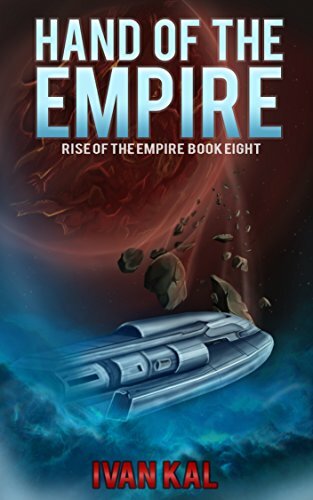 Hand of the Empire is book 8 in the Rise of the Empire series, an epic story that follows humanity as it grows from a single world to ultimately becoming a galaxy wide empire.